LA GRANDE, Ore. (EOU) – Cross the threshold of the EOU music department in Loso Hall and enter a virtual surround-sound of snapping fingers, instruments, singing and an occasional high-pitched squeal. The squeals do not emanate from a specific instrument or arrangement, but from students expressing their excitement about the music department’s upcoming tour. Through the years, EOU groups have set out on some pretty big adventures including excursions to China, Ecuador, Eastern Europe and Alaska. This year, students and faculty are headed north again and they’re taking the music of the 1980’s with them. A cast of 62 members including a 10-piece band will rock the production, “Totally 80′s Rewind,” across southeast Alaska, including stops at Juneau, Ketchikan and Wrangell. 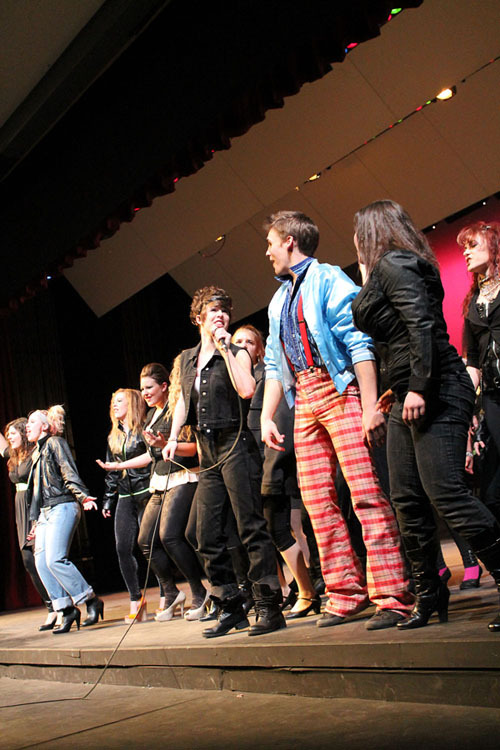 The EOU music department and Chamber Choir presented the 80′s show last January and the Alaska tour is a continuation of a production that began developing in the spring of 2012 with students from Professor Peter Wordelman’s seminar course. Holly Sorensen, Luke Basile, Jonathan Davidson, Mike Kellison and Lindsay Martin constructed and arranged the entire program to fit the strength of the choir and instrumental ensemble. EOU music students and faculty share the stage and throughout the show all the performers have one or more featured solo moments. Some pieces are performed a cappella, the band accompanies several of the numbers, and still others include “vocal percussion.” An a cappella version of “Still Haven’t Found What I’m Looking for” by the rock group U2 is a prime example. Just when the harmonies intermingle and linger for a quick second, the piece moves into the bridge and percussion takes over – yet there are no visible drums being played. Vocal percussion sounds are produced without the help of traditional instruments and EOU student Jacob Mitchell is a master at performing them. “It brings depth to the tune, and Jacob does it very well,” Wordelman said. What does a music professor add to a production that has such a wide array of talent and an extensive range of music? Choreography, and Wordelman is always looking for opportunities for students to learn from other professionals in the business. That is where Catherine Herrmann comes in. A La Grande native, Eastern alumna and University of Georgia-Athens graduate, Herrmann now lives in New York City and has returned home to choreograph several EOU productions. Exciting as it is, some students were hesitant to add movement to the somewhat complicated music. During the nine-day trip to Alaska, the group will stay at hotels part of the time and also at private host homes. The host homes in Ketchikan were arranged in part by choir member and Juneau native, Emily Smith. Another student from Alaska, Caite Debevec, hails from Sitka, where the group will stop for a short time during a 26-hour ferry ride. The group will perform at middle and high schools, and also conduct music workshops. These venues provide opportunities to promote enrollment at EOU, and students and faculty will be on hand to answer questions and offer perspective on what it’s like to attend the university. “Our students have a unique opportunity to participate in many different ensembles and performances,” Wordelman continued. Embarking on an expedition like this takes a tidy sum of money – money the music department does not have an abundance of. The group does, however, have immeasurable support from the university and Union County communities, substantiated at its well-attended events. Bob Coulter, owner of Red Cross Drug Store, is a major event sponsor for EOU’s choral groups, from the 80’s concert to the annual Choirs of the Valley performances. Steven Koza, D.M.D., of Koza Family Dental Care, is also stepping forward as a major supporter of the Holiday Music Festival and spring choral concert. Students have been busy raising funds for the journey by performing in concerts, organizing and selling tickets for a raffle and strategically placing tip jars. Individuals are also responsible for air fair. The nine-day excursion begins March 22, kicking-off a spring break like no other for the musical troupe. From Earth, Wind and Fire to Joan Jett, Cindy Lauper and Michael Jackson, it is sure to be a wonderful experience from the audiences’ perspective as well.